The lunacy of the fifth season of 'Allo, 'Allo! 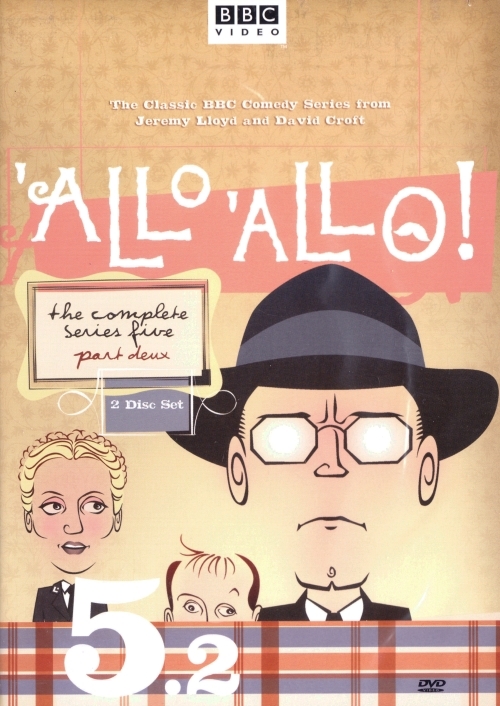 continues on this two-disc set (13 episodes plus cast bios and trailers), as beleaguered French cafe owner Rene Artois (the indefatigable British comedic actor Gordon Kaye) tries to keep his life in balance. No easy trick in occupied France--his town is crawling with unhinged Nazi officers; deadly serious but not necessarily brilliant French Resistance leaders; his semi-clueless wife, Edith (Carmen Silvera); and every waitress in his café who seems to have the hots for him. Zut! The series hits its stride during season 5, the mid-point of its long, successful BBC run. The gags rely on very silly accents, lots of cross-dressing (did you know female German officers were "allowed" to grow mustaches of "tasteful length"? ), and over-the-top plots to foil the Nazis. One particularly memorable episode in this series involves disguising explosives in 500 Christmas puddings that René is asked to house at his café. How, he pleads, is he to explain the presence of 500 Christmas puddings at his tiny bistro? Resistance leader Michelle, exasperated: "Just say you have cornered ze market!"